Do you hate that 5:00 question as much as I do? You know the one…”what’s for dinner?” That of course is followed by the obligatory “dinner dance” of opening the pantry, fridge, and freezer, and staring blankly. It’s almost like I expect our meal ingredients to light up with a neon sign and sing a little song – “use meeee to make the perfect dinner tonight!” Alas, that has yet to happen. But a mom can hope, can’t she? 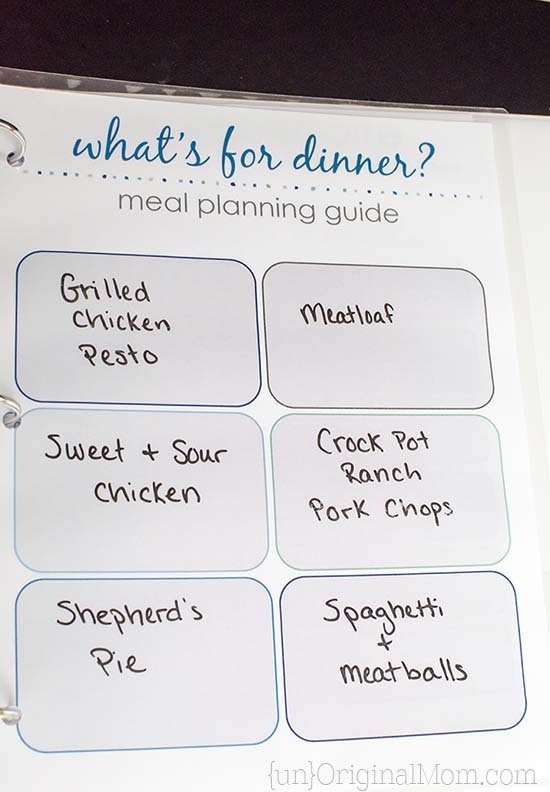 Last year, amidst the organization rush of New Year’s Resolution and frustrated with that question, I created a Meal Planning Guide as part of our family’s Command Center, and it has truly been a life saver for me. You see, I didn’t like the meal-assigned-to-each-day method of meal planning…what if I didn’t feel like making chicken on Tuesday? Or I had a horrible day and just want to pick up a pizza? Or we got an invite for dinner at my parent’s house? 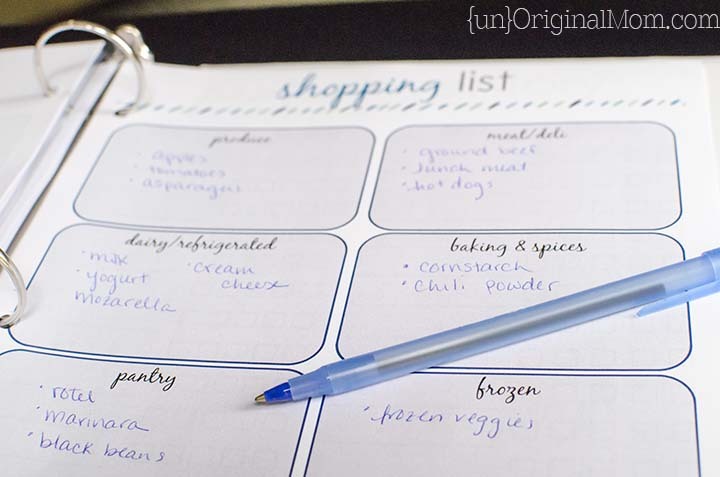 This method of meal planning is still organized, but a little less rigid. 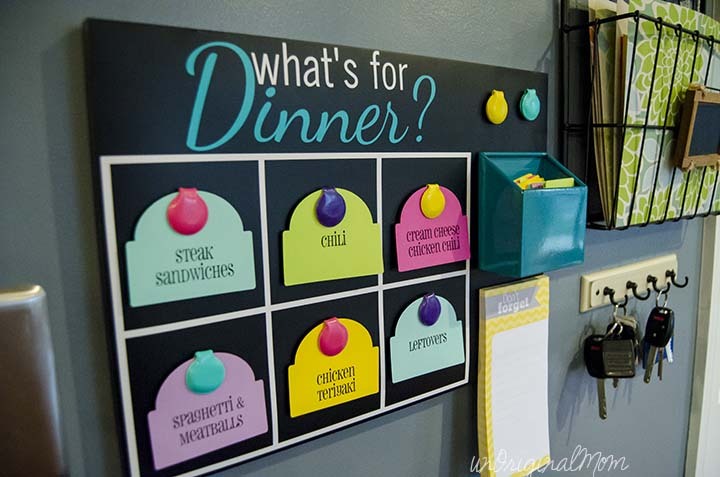 Here’s how it works: I’ve got little tags printed with my dinner “repertoire” that I pick out and put on the magnet board as I make my grocery list each week. That way, I have 6 meals that I know I have the ingredients on-hand to prepare. No more staring blankly into the pantry at 5 pm! Of course, there are weeks that I may not get to my planning and shopping until Tuesday or Wednesday…and some weeks that I don’t get around to it at all…but it’s a really useful tool for me when I do use it, no matter what day of the week it is! As terrific as the menu board has been, I decided to take it a bit further and make a binder out of it. 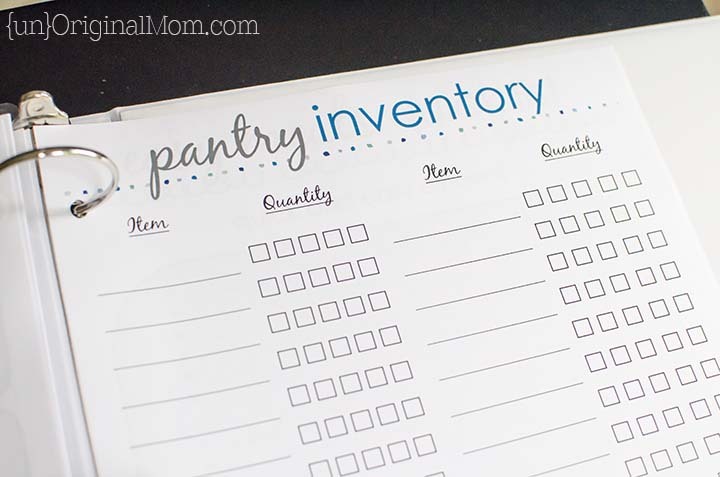 I’ve definitely fallen down on my meal planning since the baby was born in January, and I’ve often found myself not making it to the grocery store until we are desperately in need of milk, eggs, and bread. 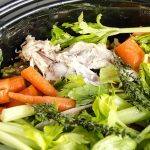 So I sat down and brainstormed how I could streamline this process even more for our family…and this meal planning guide was born! 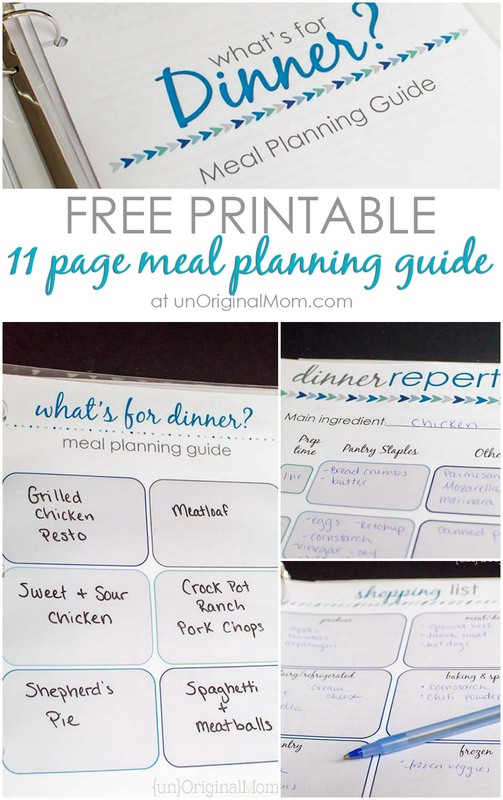 I decided to take it a step further and create a pretty printable version – ELEVEN pages full of helpful organization to make dinner planning less of a chore, ready and waiting to be assembled into your own helpful flexible meal planning guide! How do you deal with the daily “what’s for dinner?” question in your house? 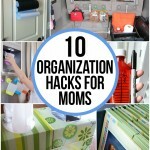 Do you have any tried-and-true methods of organization? Thanks Monique! 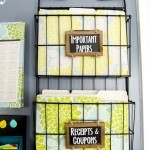 Laminating it is a great idea! Let me know how it works out for you! This definitely resonates with me! I’m too flawed to have perfect order, and I love that board! Far too often I have the “I don’t want to think!” days or those times when my boyfriend refuses to pick what he wants. Thanks! Haha yes, the “I don’t want to think” days are rather frequent around here too! Hi Jackie! There should be a link to the printable binder pages at the bottom of every email you receive from me (as well as a link in the “welcome” email you got when you subscribed) – if you can’t find it, let me know and I’ll email it to you when I get a chance! 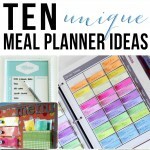 I was so excited to see your meal planning guide! But for some reason the confirmation email will not come through. Is there another way I can get on your list? Hi Angela, I just replied to your email! 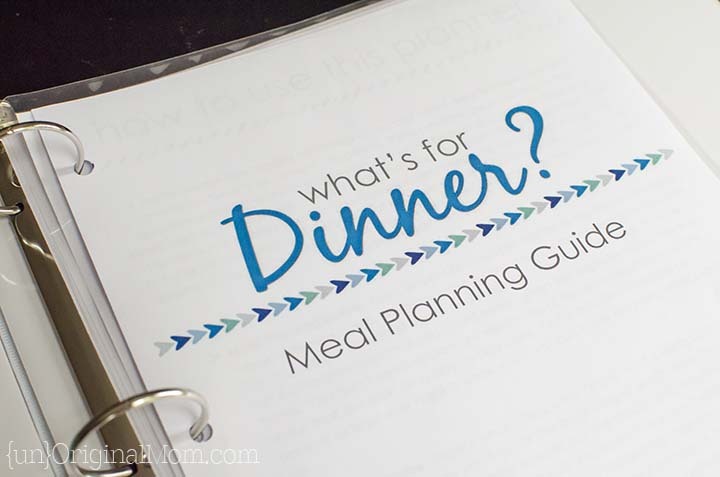 Hi, your meal planning printable set looks awesome :) I subscribe to your Newsletter, but I don’t have this… can you please send me a link to download it? I need all the organizing help I can get ;) Cheers! love this command center. would you happen to have the download in a user-friendly format? i don’t have a silhouette and when i got to download it, i’m prompted that i don’t have the correct format.